Easily work out your entire hardwood flooring project budget in seconds. Calculate square footage of rooms, cost of materials per room and even add in waste factor, tool rentals, moldings, baseboards and other miscellaneous expenses. Plus, print the results for your records. Congrats! You found the best square footage and cost calculator for flooring projects. At Easiklip DIY Hardwood Floors, we are a hardwood floor store, so naturally, we'd love for you to calculate costs for your DIY hardwood flooring project. But really, you can use this as a laminate flooring calculator, or even for tile, vinyl, engineered wood and just about any flooring you can imagine! To use this calculator, simply plug in the dimensions of the rooms that require flooring and the cost of the material for each room. For example, if you had a room that was 4 feet 5 inches by 4 feet 5 inches and the cost of flooring materials was 5 dollars per square feet, then you would enter 4 into the first box and 5 feet into the one right of that then 4 to the right of that and then another 5 and in the last column you would put a 5. Once finished inputting all your dimensions, fill in the additional costs of tools and other flooring expenses. Once all that is done, press the Calculate button and the cost estimate will be revealed to you underneath. What about smaller divisions of inches? The smallest divisions of inches typically found on rulers and tape measures are sixteenths of an inch, or 1/16th inch. Sometimes those are divided in half to get even smaller measurement units known as thirty-seconds of an inch, or 1/32 inch. EXAMPLE: Room width = 10ft 10 3/16 inches X Room width = 10ft 3 7/32 inches. EXAMPLE: Room width = 10ft 10.1875 inches X Room width = 10ft 3.21875 inches. The hardwood flooring calculator helps determine the amount of flooring material needed for your rooms. Simply enter the dimensions of your room and the calculator finds the square footage of the room. Each room can have a separate price per square foot in case each room needs a different flooring material. Whether you want to do it yourself or hire a professional, this flooring calculator can help you estimate additional fees that will be needed for your project. If you are hiring a professional flooring installer, you can input the price of the installer along with additional fees such as carpet removal, tool rental, underlayment and more. The amount of flooring needed will also include a waste factor that you can decide. This will factor into the cost to give an even better idea of how much it would cost you to finish your project. A hardwood flooring waste factor, or waste factor for any type of flooring, is simply the amount of extra flooring material you need to compensate for material wastage during installation. Why do materials get wasted? Your flooring manufacturer will be able to tell you the waste factor they recommend for their particular product. Typically it is around 10%. At Easiklip Floors, we recommend a waste factor of 5-8% when using our clip-together solid hardwood flooring like Natural Oak, Greywash, Rustic Smoke Stain or Rustic White Bleach. 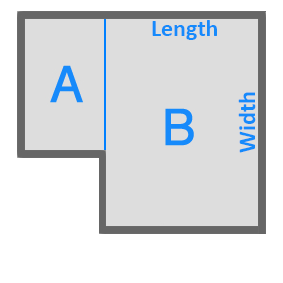 Measure the room's length and width. If the area is not a simple shape, then break the room into separate squares. Calculate the square footage of each part then add them together to get the total square footage of the room. Make sure these measurements are in feet and inches. If you measured your area in meters, convert those measurements to feet using our Meters to Feet Converter above. Find the square footage by multiplying the length of the width. In this example, and other examples like it, the trick is to split the shape into several rectangles (or squares). It doesn’t matter how you split the shape - any of the three solutions will result in the same answer. Solution 1 and 2 require that you make two shapes and add their areas together to find the total area. For solution 3 you make a larger shape (A) and subtract the smaller shape (B) from it to find the area. In this example, the trick is to use the formula. All you need to do is take the radius (the distance from the center of the circle to the outer edge of the circle) and square it (multiply by itself) then multiply it by 3.14. In this example, the trick is to see that a triangle is simply just half of a rectangle or square. After realizing that, the formula becomes clear that the area of a triangle is just the base times the height multiplied by half. What is the cost to install hardwood floors? The costs of all these tools and their supplies can add up. Start a spreadsheet for all your tool rentals and purchases, then put the total into our calculator above. Various types of floors require different underlays. They are used to dampen sound (acoustical underlayment) and/or protect agains moisture seeping up from subfloors (moisture barriers or damp-proof membranes). Underlayments can be made out of cork, plastic, foam or a combination of these. For an Easiklip solid wood floor installation, we recommend a 3-in-1 underlay like this one from Amerique. Baseboards, also known as 'skirting,' 'moulding' or 'molding', are boards used for aesthetic reasons to cover the expansion gap at the edge of a hardwood floor. They create a pleasing transition from the flooring to the walls. Baseboards can be made from plastic or wood. Aka "Transition Mouldings" are used to bridge the gap between different types of flooring. If your hardwood floor in your living room needs to transition to your tile floor in your kitchen, you'll need a transition moulding . Self explanatory. Depending on your work site, if you can allocate a big enough area for waste collection, you may only need one dump run. Remember, you'll have plenty of waste and recycling from flooring packaging materials, wasted end pieces and damaged flooring, plus any old carpet that may be getting torn up. Some cities also have anti-dumping rules that require special procedures for disposing of old engineered flooring waste as it can contain hazardous substances. Do some research as this can add significant costs to your wast disposal. Unless you're doing your entire renovation yourself, you'll probably have to pay someone to help you out. Try visiting a site like Trusted Pros to get a quote for professional hardwood floor installers and handymen in your area. Again, Trusted Pros is a great site for finding a company to service your entire hardwood flooring installation. Got any other expense items that are unique to your situation? Add them up and put them into the calculator. As a general rule of thumb, it is generally fairly safe to estimate that an installer will charge you nearly what you paid for the flooring. So if you paid $3 per square foot for your hardwood flooring, you can expect to pay about $3 per square foot for installation. As you can see, there are many factors that influence the installation cost of your wood flooring. It is always best to reach out to a few local contractors in your area and get at least 3 estimates before deciding how you will proceed. Obviously, you can save hundreds, or even thousands of dollars, by installing your floors yourself. Just check out this video of a couple guys installing an 800 square foot hardwood floor in just 10 hours with no experience! They used Easiklip Solid Hardwood Flooring.